Right now there are millions of Americans living with gum disease; however, only a small percentage of these Americans will seek professional dental treatment. Medical research has linked gum disease to a wide variety of health complications including diabetes, pancreatic cancer, heart disease, and low birth weight. Gum disease could also be more significant during pregnancy. While gum disease may seem like an inconvenience or irritation in its early stages, it is a significant health risk that should be taken seriously. If you are suffering from gum disease, you have a variety of dental treatment options available to you. Lightfoot Center for Laser Periodontics in Hingham, MA and Norwood, MA (South Shore area) is dedicated to restoring your dental health through gum disease treatments such as LANAP® and LAPIP®. Maintaining healthy gums and teeth is important for your appearance as well as your overall health. You should trust the care of your teeth and gums to Lightfoot Center for Laser Periodontics in Hingham, MA. An excellent advanced dental option for patients, the Laser Assisted New Attachment Procedure (LANAP®) uses laser technology to successfully eradicate gum disease with less pain and less downtime than traditional methods. Proven laser gum surgery eliminates the bacteria that cause gum disease without the use of traditional dental tools such as, scalpels or sutures. This innovative laser treatment is backed by both laboratory and clinical research. Using a PerioLase™ laser, your periodontist removes diseased gum tissues. This creates an environment in your mouth where your body can heal itself. Here at Lightfoot Periodontics, we believe in helping our patients to have the most comfortable, uncomplicated, and advanced treatments available. For patients missing one or more teeth, dental implants provide a permanent restoration option with a natural look. A dental implant consists of metal posts or frames which are surgically placed into bone beneath the gums. These then fuse with the jawbone and provide stable support for restorations or dentures. 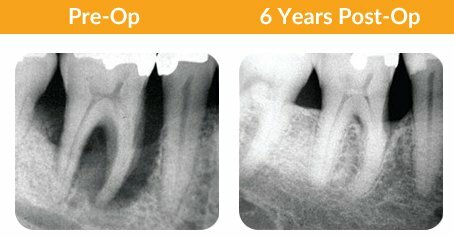 Even with advanced dental implant technology, implants are not immune to gum disease. Peri-Implantitis is a common condition where infections develop below the gum line, potentially resulting in bone loss around the dental implant. In some cases, the implant could fail. In the past, if gum disease infected an area around an implant, it would usually result in removal of the implant and surgical repair. LAPIP® is a FDA-cleared procedure to treat gum disease around infected implants. Like LANAP®, this procedure does not involve traditional dental equipment. It helps remove unhealthy tissues and kills harmful bacteria below the gum line. In addition, it can stimulate healthy tissue and may encourage bone development.